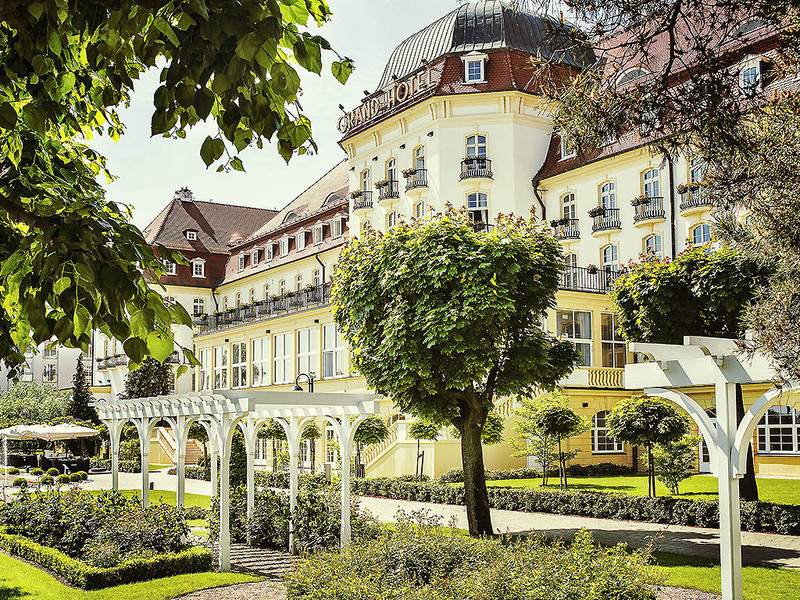 The five-star Sofitel Grand Sopot Hotel is located on the beach, a few steps from the vibrant city centre. The longest wooden pier in Europe is located right next to the hotel. It has 126 rooms and suites and a private beach. The hotel was built in 1927 and immediately became synonymous with class and luxury. Today, it captivates with its renovated interiors, the unique atmosphere and view of the sea. In our Art Deco restaurant you can enjoy creative French cuisine with a Polish twist and our Le Bar offers a wide range of elegant cocktails. Visit our Grand Spa where the various treatments on offer can help you relax. GDYNIA : Niepodleglosci Sopot Grand Hot. GDANSK - GDYNIA : Sopot Grand Hot. During breakfast we offer a wide range of dishes, fresh fruit, bread and cakes. For a light lunch or an exquisite dinner we recommend fresh fish prepared according to a Polish recipe with French passion. The art deco style Le Bar, with its wide range of the best whiskeys and expert cocktails, is the perfect place for an evening drink. In the morning, you can enjoy an aromatic coffee while reading the latest newspapers. Great Hotel with Lovely Staff! An amazing hotel with impeccable service and attention to detail! Had been looking forward to staying here for a while, and was thoroughly enjoyed every moment. The weather was a tad chilly so will be back in the Summer! I always enjoy staying at Grand Hotel. The hotel is beautiful, the seafood is great and the staff go out of their way to make you feel welcome. I feel very at home there. Very nice with superb staff. Internet access for me was a mess, had start over every day as it was the first time signin in. We had a very good stay in your hotel with the highest service standard in all areas starting with the reception welcoming, car parking with suitable place close to the entrance, service in the restaurant, closing with the extended stay for some hours more. There is some remarks regarding our room key card, they have been blocked, service person opened the room with his card, took ours and didn't bring the new ones to us to the room. We have to back to the reception to take the new ones. The rest was great, no any complains. Best hotel ever! Beautiful, clean with wonderful staff, delicious food! My bday welcome - never forgetthank you for wonderful weekend! I liked the overall service which was offered. Great stay at this hotel. Great location. Nice room. Nice view. Nice beach. Great staff. We had a great time at the Grand surrounded by lovely Art Deco. The spa was very relaxing and the breakfast was one of the best we’ve ever had. The bar was one of our favourite places to sit. The bed was very comfortable and the only things we thought could be better was that the room was very hot at night (even though cold outside) and we had to use the fan and open our window which made it noisy and the shower was not very powerful. The room was very comfortable, unfortunately I was upgraded to a sea view room that was facing the lift, which was quite noisy. Personnel was very nice and helpful as usual, but I found it a bit strange that I was welcomed as if I was there for the first time (although it was my third visit in 4 months). All nice anyway. Hotel was beautiful and location perfect. hotel staff was really nice. Our room was nice. Bed was super awesome but over look of room was poor. Room looked like a cheap hotel room. For that price and name I thought rooms would look good too like all the other parts of the hotel. it was just fine this time! We stayed there last year during the same month and the quality of service was much much better! The service during breakfast seemed less qualified than last year so maybe some more trainings would be needed...?